Flipboard is a popular news aggregation app that launched all the way back in 2010 for Apple’s first iPad. Since then, the platform has grown to become one of the best apps I’ve ever used. Flipboard was impressive on the first-generation iPad. It used a digital newspaper-type of layout, and physical page flips to make the app feel engaging while still being easy to use and read. The app has maintained much of its core design in the years since, and to me, it doesn’t look as magical on a smaller phone screen, but it still features a clean aesthetic and works flawlessly. Flipboard isn’t all about its design though. The incredibly wide range of content sources and great aggregation algorithms are what make the service a fantastic one-stop-shop for all of your news and social media needs. To set up the app, you first need to select a host topics you’re interested in. These topics are called ‘Magazines.’ For example, I follow ‘Technology,’ ‘Gear’ and ‘Gadgets,’ ‘Flim,’ the ‘Daily Edition’ and many more. Each Magazine manages up-to-date news from a variety of reliable web sources. Users can dive into each Magazine on its own, or read the ‘For You’ section on the home page which has content from a variety of sources. You can even integrate specific social media accounts into Flipboard. For instance, I have my Twitter feed added to my list of Magazines, so popular tweets get added to my For You section. While Flipboard isn’t my main Twitter client, it’s cool to see tweets combined with all my news. It’s also possible to create your own Magazines with Flipboard. Most people will likely build Magazines for three reasons — for reading specific sources, for sharing content with people and for collecting your own read later list. You can also follow other user’s Magazines on Flipboard if they’re public. ‘Smart Magazines’ are a mix of custom Magazines and Flipboard’s curated Magazines. Just select a topic and a few hashtags and Flipboard’s algorithms automatically finds content to fill up the Magazine. The more content that is loaded into Flipboard makes it a better app. In total I follow 48 Magazines. Though I don’t read them all, it makes my For You section entertaining, varied and offers me news I wouldn’t go out of my way to look for. 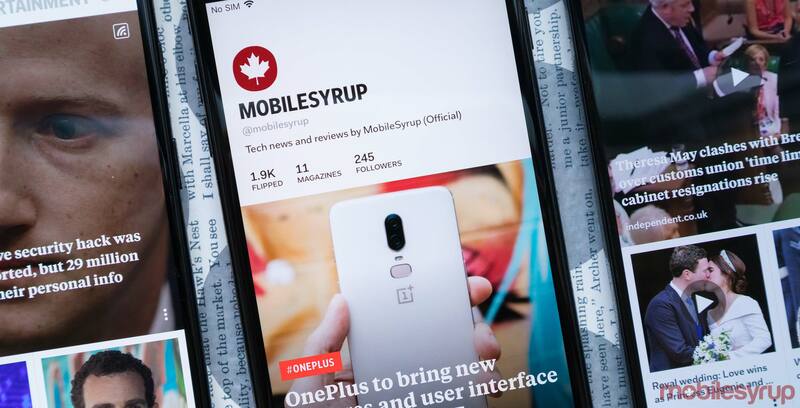 The home page has the For You section and the ‘Home Carousel,’ which holds nine Smart Magazines that can be customized, and the user’s Daily Edition news digest. The Daily Edition is a list of general news stories that the app has determined are essential. Flipboard also has tons of lists and content that it creates as well. 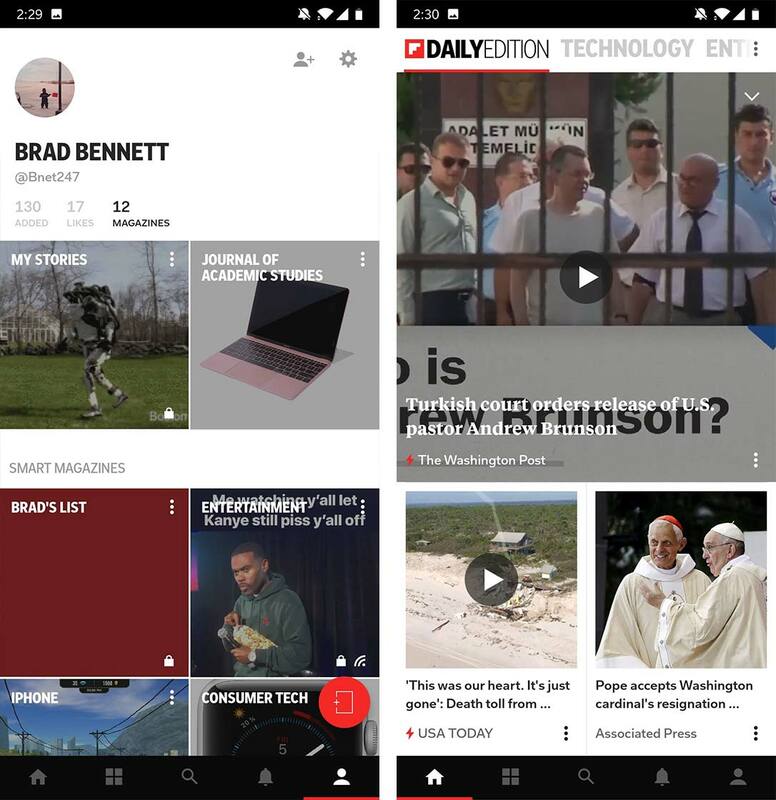 Every day there’s a new ’10 for Today’ list of top stories, and during big news events, the Flipboard team often creates on-the-fly Magazines to group all of the news into one place. Further, there’s even a web app that lets you browse your magazines on a computer. If you’re interested in downloading Flipboard’s dedicated mobile app, the platform is available for free on iOS and Android. 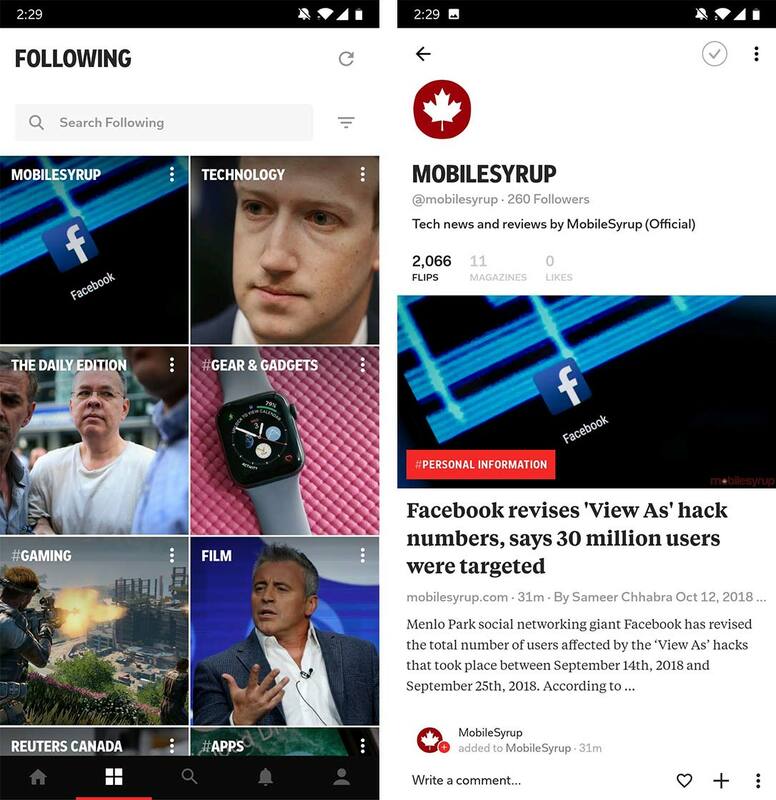 Make sure to follow MobileSyrup’s publisher account to get all of our Canadian tech news on Flipboard.